Westboro goalie Jeff Bernard has quietly been one of Central MA's best the last two years. With the state lacrosse tournaments kicking off this week, we figured we'd squeeze in one last set of Power Rankings before postseason play begins. We won't be updating these until after the state championships, so the entire postseason will be taken into account for those rankings. For more on the upcoming tournaments, you can check out our bracket previews below. But, until the tournament ends, check out our final regular season Top-10 in Central Mass. Last Week: Ranked No. 1. Defeated No. 4 Grafton 9-8 (OT). The Rangers claimed our top spot for the first time last week, and promptly proved they deserved it with a thrilling overtime victory over Grafton. Westboro heads into the D2 C/W tournament as the 3-seed, the highest seed of any Central Mass team, and opens up play at home Tuesday against Chicopee. Last Week: Ranked No. 2. Defeated No. 9 Marlboro 13-12. Lost to Xaverian 12-10. The Pioneers continued their brutal slate with a tough loss at D1 state title contender Xaverian, then came home to win a tough one against Marlboro. Things won't get any easier, as St. John's opens tournament play at home against Worcester on Tuesday. Last Week: Ranked No. 4. Defeated No. 3 Algonquin 8-5. Lost to No. 1 Westboro 9-8 (OT). The Indians are the only riser in our rankings, after leading Westboro until the final 30 seconds of regulation, and defeating Algonquin on senior day. With a few personnel changes and a new attitude, Grafton looks to rediscover last season's tournament magic. The Indians open up their D3 C/W tournament as the 2-seed, and host the winner of the Blackstone Valley Tech-Monty Tech game. Last Week: Ranked No. 3. Lost to No. 4 Grafton 8-5. The Tomahawks are dealing with an injury to All-American middie Mike Martens, and come into the tournament on a four-game losing streak. Even so, Algonquin will be heavily favored in its first round game against Northampton Wednesday, and if the T-Hawks get any momentum, watch out. Last Week: Ranked No. 5. Defeated Nashoba 12-3. The Crusaders finished their regular season strong with a convincing win against Nashoba, and enter the D3 C/E tournament as the biggest challenger to reigning state champion Dover-Sherborn on that side of the bracket. But before G-D can even think about that, it will have to win a first round home game against Bedford Wednesday at 3 pm. Last Week: Ranked No. 6. Defeated Nipmuc 12-11. The Tigers gutted out a tough win against Nipmc last Monday, and have over a week to prepare for a rubber match with league co-champion Tyngsboro. 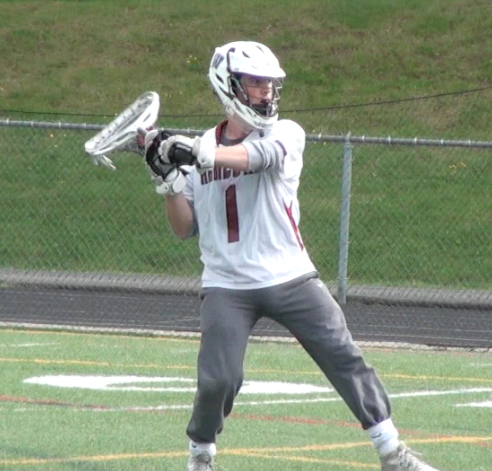 With several of the region's best offensive play makers, and two of the region's more underrated goalies in Littleton's Eric Rauker and Tyngsboro's Dan Powers, that should be a great one. Last Week: Ranked No. 7. Idle. The Tigers remained dormant last week, but you can be sure they'll wake up in a hurry for Thursday's trip to Littleton. Both groups have to be viewing that as a "true" league championship game, and the winner has a chance to make some real noise in the D3 C/E bracket. Last Week: Ranked No. 8. Defeated Hudson 20-7. The Mountaineers got back on track with a dominant offensive performance against Hudson, and enter the D2 C/W bracket as a trendy choice to make a deep run. Wachusett will open up at Chicopee Comprehensive Tuesday, under the lights at 7 pm. Last Week: Ranked No. 9. Defeated Shrewsbury 14-9. Lost to No. 2 St. John's 13-12. The Panthers rallied furiously against St. John's last Wednesday, and proved they can play with anybody in D2 Central/West in the progress. With one of the best young lineups in the state, Marlboro is one of the bracket's most interesting teams. Last Week: Ranked No. 10. Defeated Shepherd Hill 12-6 and Chicopee Comprehensive 12-4. The Warriors come into the tournament winners of six straight, and face the aforementioned Panthers in what should be the most exciting first round game in Division 2 Central/West on Tuesday. objectively Westboro guy is coach of the year ! And I am not from Westboro. Westboro Coach is doing outstanding job and deserves coach of year. He gets them ready to play and best at making in game adjustments.